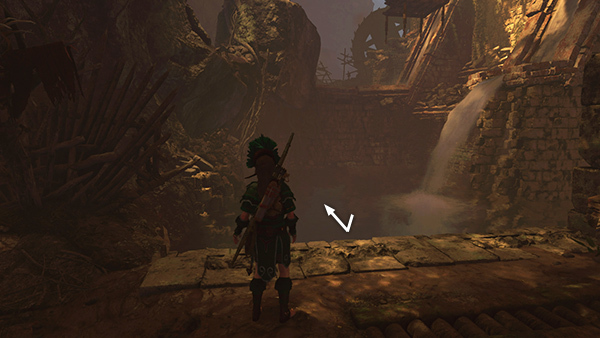 Use a rope arrow to pull down the wooden barrier between the two pools, now dry. 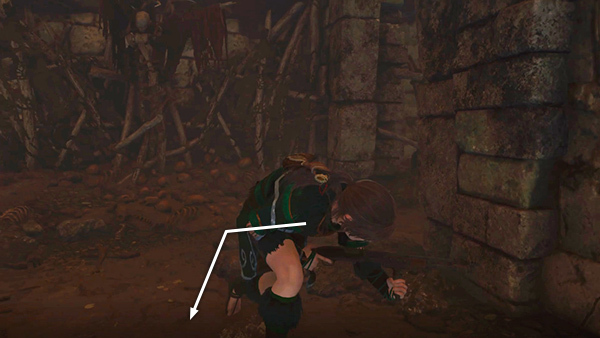 Lara crouches as she senses enemies nearby. 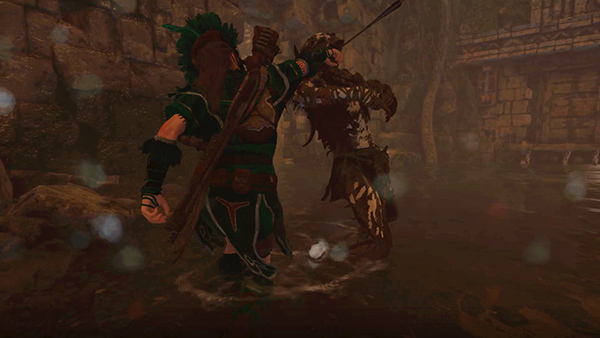 There are 4 in all: 2 Yaaxil warriors and 2 archers. 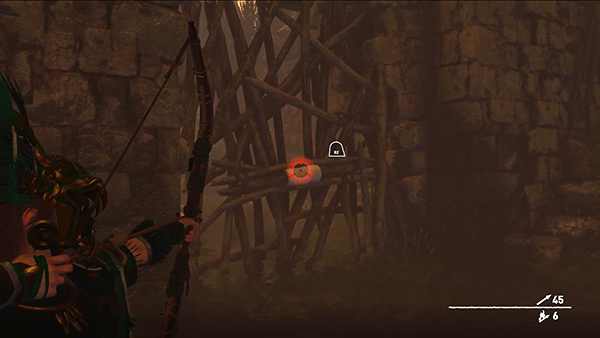 If you move to the left, away from the doorway, the archers will not be able to see Lara while you fight the others. Switch weapons if you like and either blast the warriors as they approach. 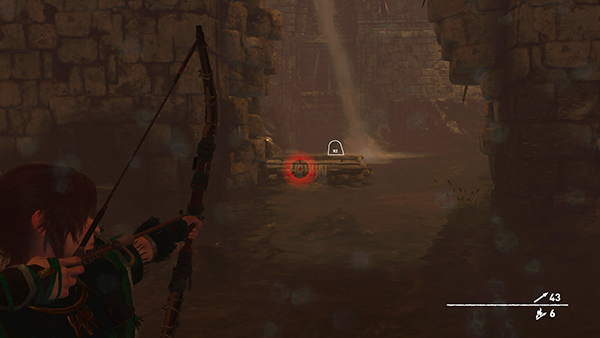 Or, if you've unlocked the Puma's Feint skill, hold Aim to keep your bow drawn. 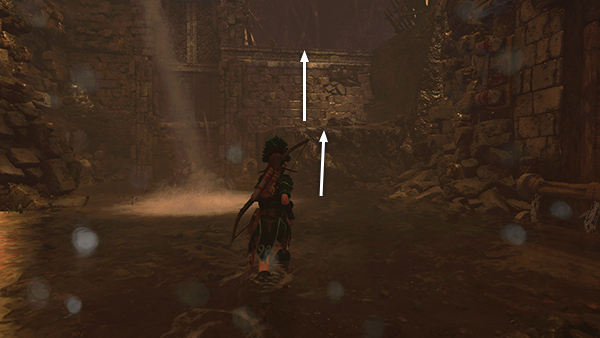 Make sure you have room to maneuver, since this won't work if Lara is too close to the wall. 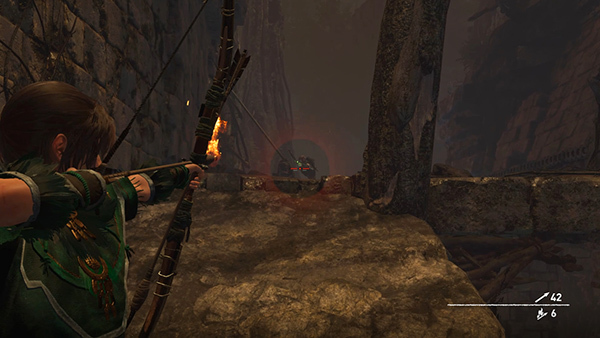 Then, when the first warrior lunges at Lara, press C on the keyboard, Circle or B on the controller, to dodge. 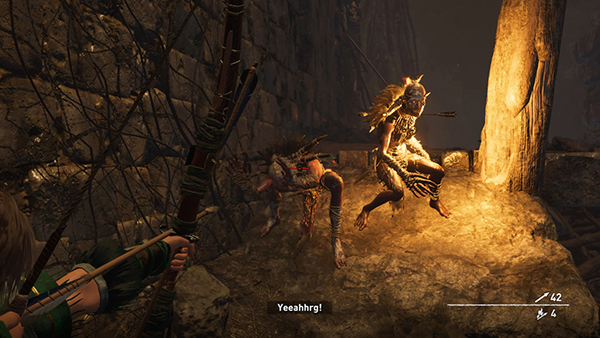 ...to stab the Yaaxil with an arrow. 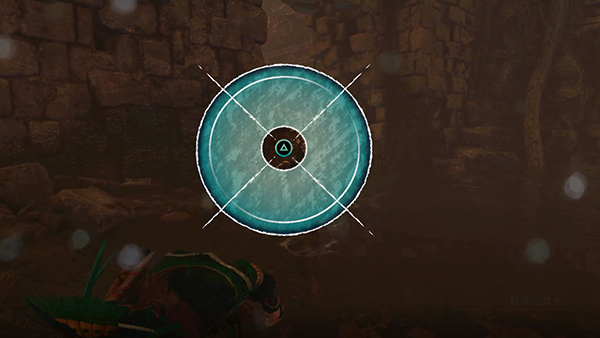 Shoot the second warrior or use the Puma's Feint/Dodge Kill maneuver again. 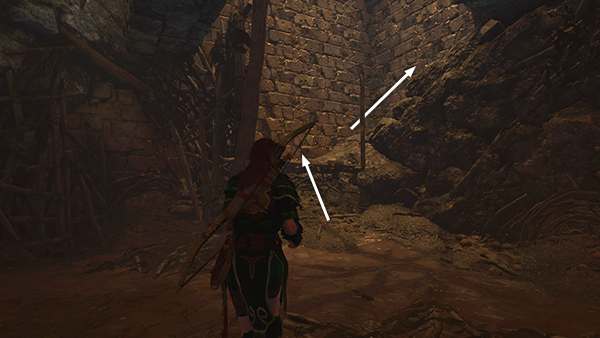 Now switch to the bow or rifle, if you aren't already using it, peer around the edge of the doorway to spot the 2 archers on the ledges ahead. 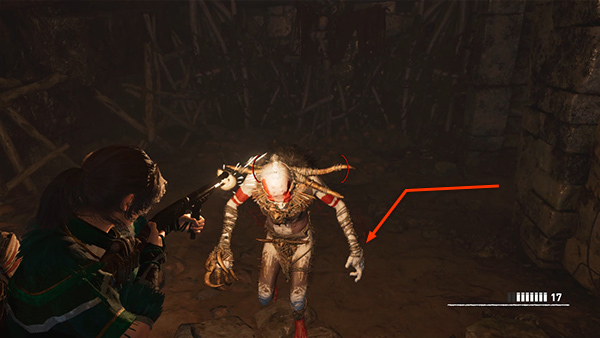 If you're playing on a difficulty setting that allows Survival Instinct, pressing it now will make it much easer to see the enemies in the gloom. 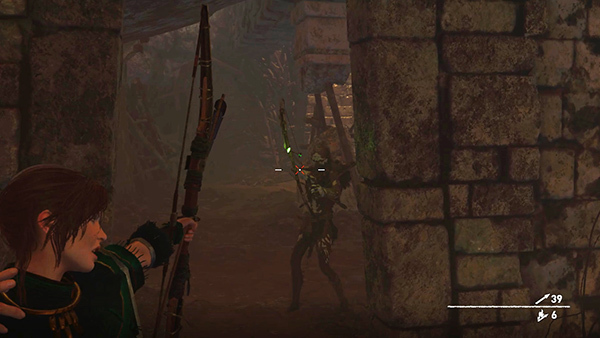 Kill both with headshots, fire arrows, etc. 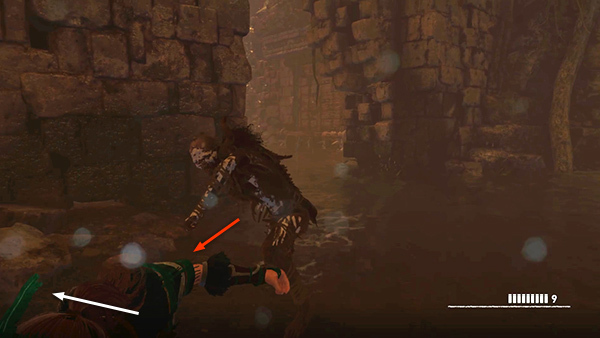 Loot the warriors' bodies. 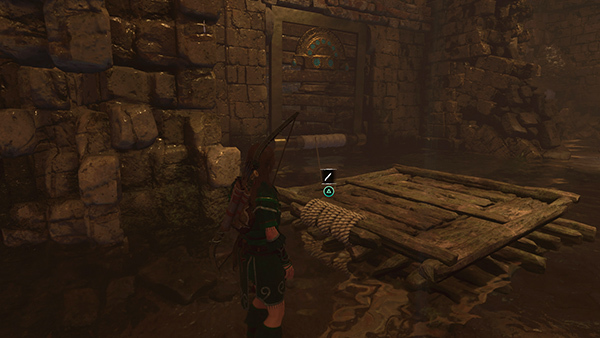 Then go through the doorway and use your knife to cut the rope tethering the wooden raft to the door. ...to drag it through the doorway into the east room. 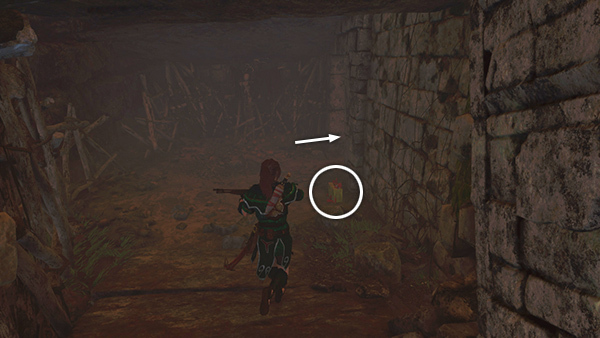 Go through the doorway into the west room and climb up to the ledge where you started, searching the archers' corpses on the way. 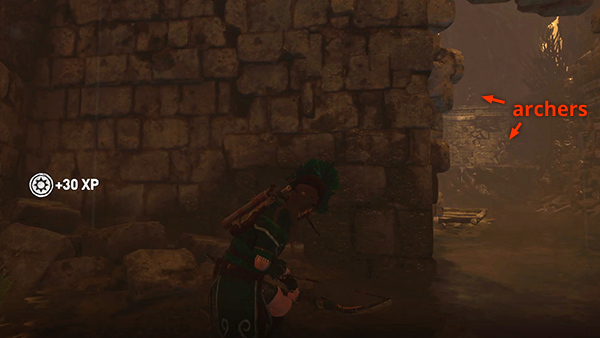 ...to raise the water level once more. Swim down through the doorway into the east room. 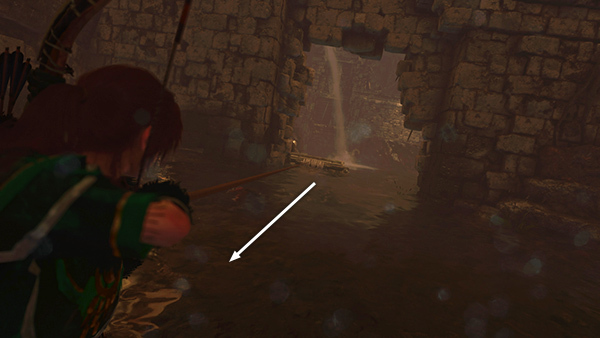 NOTE: Again, if you fill the pools before moving the wooden raft into the other room, just use either of the underwater handles to drain the water. Then move the raft, climb up onto the western ledge, and pull the handle on the track to refill the pools. Climb out of the water onto the wooden raft. Then jump into the doorway. Pick up some shotgun ammo just inside on the right. 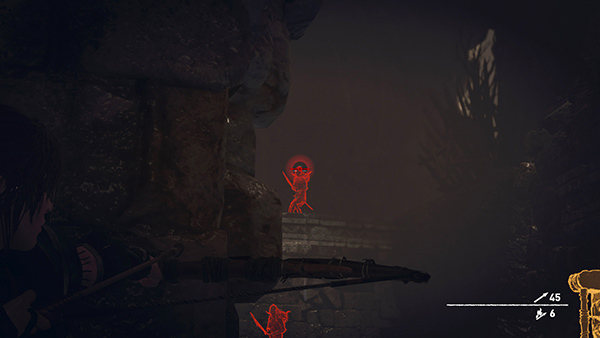 Then enter the next room to trigger 4 more enemies. ...you can fight them one at a time as they approach. 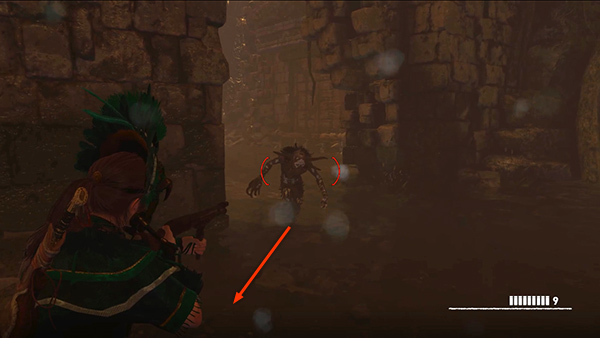 Either blast them with the shotgun (or your weapon of choice), or use the Puma's Feint/Dodge Kill on the first 3 enemies, all warriors. 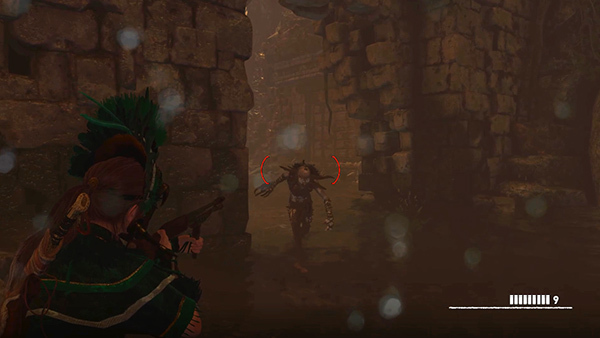 Then either wait for the fourth, a Yaaxil archer, to come to you or move into the doorway and shoot him when he comes into range. Search all the bodies. 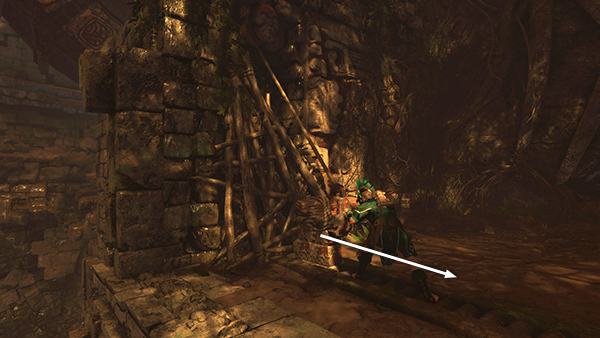 Then climb onto the ledge on the far side of the room and follow the ramp up to meet 3 more enemies, an archer and 2 more warriors. 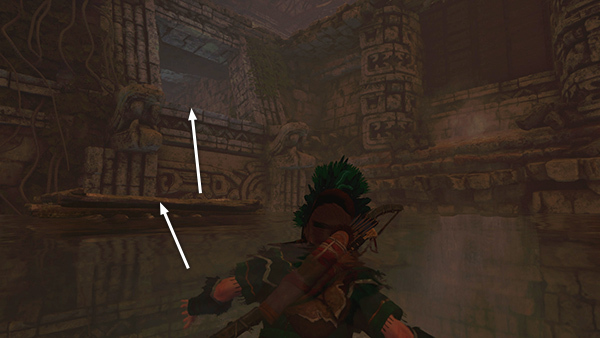 ...you can finish off the others as they charge, without also taking damage from flying arrows. Loot those bodies as well.